Campus Notices | Street Sticker Exhibits at the Museum of Culture and Environment! Re-Writing the Streets: The International Language of Stickers and Paper Bullets: 100 Years of Political Stickers from Around the World are now on display at the Museum of Culture and Environment in Dean Hall. The MCE is free and open to the public Wednesday through Friday 11 a.m. to 4 p.m. and Saturday 10 a.m. to 3 p.m. For more information, visit the museum website at cwu.edu/museum, email museum@cwu.edu, or call the gallery at 509-963-2313. 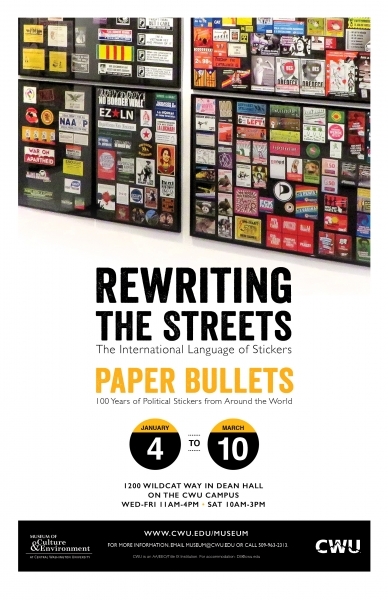 Rewriting the Streets​ shows the broad range of street stickers from around the world, while Paper Bullets ​addresses the history of political stickers, both in the U.S. and abroad. Together these exhibitions include over 1600 original, unused stickers, grouped by artist, theme, date, and geographic location. These stickers are among the finest examples from two collectors, Catherine Tedford in the United States and Oliver Baudach in Germany, and this is the first time these exhibitions have appeared in the Pacific Northwest.